When the rebellious Afridi tribe, along with the Afghani Orakzais, rise in rebellion against the British rule to occupy the modern-day North-West Frontier Province, the British Indian Army orders 21 soldiers of the 36th Sikh Regiment to hold the Fort Saragarhi until reinforcement arrived. Caught in a do-or-die situation, the brave Sikh soldiers take it upon themselves to defend their motherland and rise to the occasion against the ten thousand-strong men in the enemy camp. When the trailers showed a visibly charged up Akshay Kumar mouthing this dialogue – “Aaj jo bahega, wo lahu bhi kesari” – one could easily guess that the upcoming film based on a real-life incident is nothing less than another of Akshay Kumar’s patriotic potpourri. But the audiences are proved wrong, for director Anurag Singh’s titular movie ‘Kesari’ is a film that not just brings on the goosebumps all along but also reminds us of the bravest battle India has ever fought. The film begins during the colonial era in the year 1897, when the British had total control over the Indian population. To prove their superiority, they often look down upon Indians, mock them and call them derogatory names. Although the Indians suffer at the hands of their oppressors, they work for the British. Once, a farmer named Ishar Singh (Akshay Kumar) gets a duty call from the army general to man the Saragarhi Fort and lead his fellow soldiers at the outpost. Ishar obliges and answers his call of duty. The soldiers of the 36th Sikh Battalion at Saragarhi Fort carry out menial jobs at the fort and while away their time engaging in cockerel fights, building public shrines and the like, for life is easy at the outpost than being at home, suffering humiliation. When Havildar Ishar Singh steps foot on Saragarhi Fort, he transforms the twenty odd Sikh soldiers into pumped up warriors, who would defend their land when need be. He makes them realize their worth and what it means to be a Sikh. Though days go on normally at Saragarhi, they receive a message early in the morning of September 12 that the Afridi tribe that was given subsidy to safeguard the Khyber Pass, has risen in rebellion against the British, along with the Pashtun Orakzai mountain tribe of Afghanistan. The army would soon march on Fort Saragarhi to capture it and later take down Fort Lockhart ahead. Havildar Ishar Singh asks for backup but the absence of it leads them to make a tough decision. They can either flee the fort or hold it till reinforcement arrives. The Sikh warriors now decide to face the onslaught of the ten thousand-plus Afghans, despite being insufficiently armed and poorly defended. When the Afghans are at their doorstep, the 36th Sikh Battalion manages to stall them for seven hours at a stretch. Although they are outnumbered, they do not give in easily without putting up a brave fight. Based on a true story of valiance and courage, ‘Kesari’ is a film worth watching to experience what it took those brave, young soldiers to face thousands of barbaric enemies being surrounded on all sides. Though the movie captures the essence of the story very well, a few soul-stirring situations would have taken it to another level. A personal account of some more soldiers would have been interesting to watch, as also their state of mind when facing such a huge army. 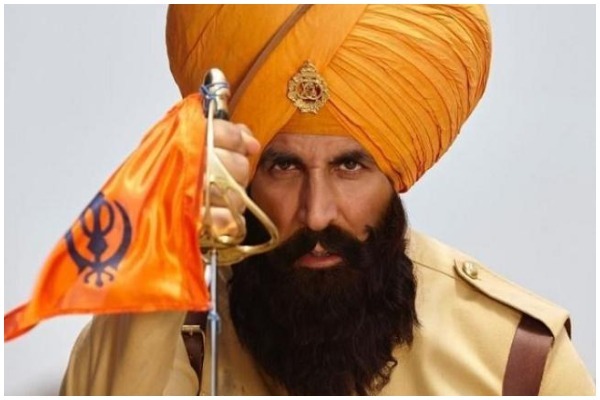 Akshay Kumar lives up to the expectation once again with his patriotic act and manages to get into the skin of Ishar Singh’s character very deep. He brings on the emotions required for the role perfectly and gives a glimpse of the man that had led his fellow soldiers to rise to the occasion in real life. He switches from a moving scene into a high-octane battle scene in the next moment very effortlessly. He single-handedly carries the film on his shoulders. Parineeti Chopra as Ishar Singh’s wife is merely a filler. She practically has no role to play in the film, except appear in some flashbacks. Vikram Kochhar, Vivek Saini, Rakesh Sharma, Jaspreet Singh and the other actors, who play the brave soldiers, hold their own ground. The climax is predictable but the way Singh has handled the scenes makes it worth the watch. Most parts of the film are shot in the rugged desert backgrounds but that does not deter the film to lose its colour in any way. The cinematography and the canvas on which the film is shot are grand and add to the film’s visual appeal. The screenplay and editing are crisp. However, some VFXs are cringe-worthy and could have been edited out. Also, in highlighting the imposing battle sequences, the director takes a few cinematic liberties, which make the movie seem caricaturish in certain places. Keeping minor flaws aside, the film is very good overall and strikes the right chords at all the right places. A must watch film to re-live a piece of history that that have gone down in the annals and somehow forgotten.